The Home Repair Program has received a $7,500 grant to provide emergency home repairs to low-income homeowners in Benzie County! We are extremely grateful to the Benzie County Community Chest Grant Committee and donors for their generosity. To request an application for assistance, please contact Leslie Casselman via email or at the Traverse City office at (231) 346-2131. 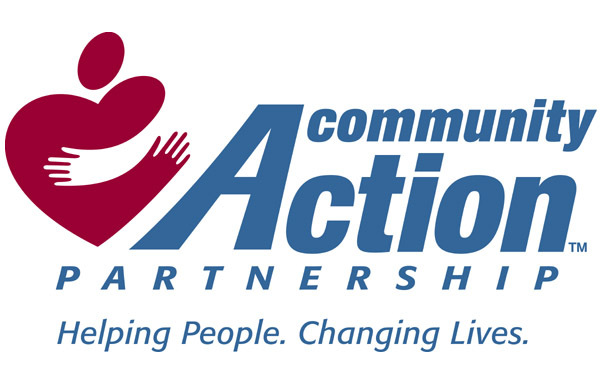 The Home Repair Program has received a $5,000 grant to provide emergency home repairs to low-income homeowners in Benzie, Grand Traverse, Kalkaska, Leelanau and Wexford Counties! Veterans and their families as well as Cherryland Electric customers are being given preference to receive these repairs, however anyone residing in the targeted counties with an emergency repair concern are welcome to apply! We would like to express our sincere gratitude to Cherryland Electric Cooperative for making this available and its members for contributing towards this program by rounding up their bills each month to the nearest whole dollar amount. To request an application for assistance, please contact Kelsey Hyde via email or at the Traverse City office at (231)346-2131. The well-known visual cues of homelessness are not often on display in Northern Michigan, but human service providers say the issue affects hundreds of people yearly in the region. Read more. A street clean-up, community yard sale and a lot of fun. It was all part of celebrating NeighborWorks Week in Traverse City. Via 9 & 10 News. The Petoskey office hosted a flower planting event to beautify a future home site at 36 Bridge Street in Petoskey. 9 & 10 News Coverage. Homebuyer Education Workshops are provided on a monthly basis in each of the three offices. As an employee of the agency, attendee of a two-night homebuyer education workshop, and recent a first-time homebuyer, Carrie tells her story. 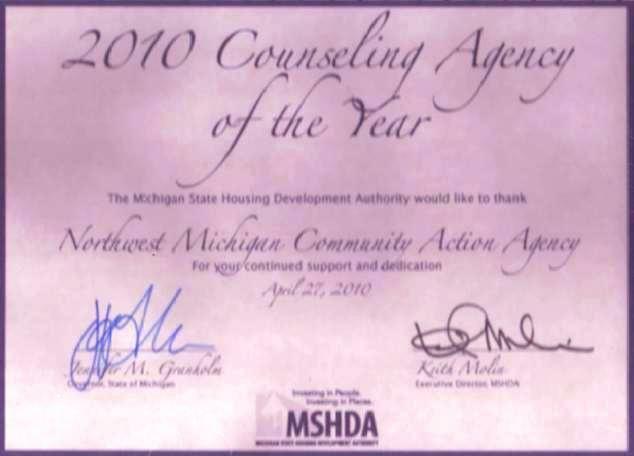 Northwest Michigan Community Action Agency (NMCAA) was named the 2010 Housing Counseling Agency of the Year by the Michigan State Housing Development Authority. This award highlights the comprehensive housing counseling program for first-time homebuyers, Earned Income Tax Credit education and preparation, and Individual Development Accounts, in addtion to the agency's participation in National Foreclosure Mitigation Counseling, the American Recovery and Reinvestment Act funding and the administration of a 5 county Community Development Block Grant programs for home repairs, along with many more programs. 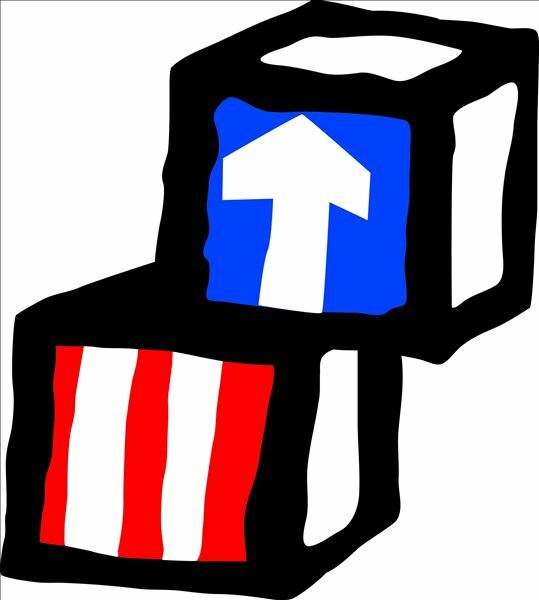 Through the 36 year history, NMCAA has been dedicated to the improvement and self-sufficiency of families. This is accomplished by assisting residents to solve community problems as well as meet their individual needs through case management counseling, advocacy, group participation, and service provision. This award embodies the hard work and didication of a quality staff and program.